To begin with: the phone delivers big time in being adorable. Everyone that sees the phone loves the basic design, the big buttons and the way the phonebook is added as paper book attached to the back. The colour is subject of discussion, but that is a taste thing. I agree fully on all these reactions. I found the phone very cute. What I also like a lot is the playfulness that can be found in the little creature that houses in the display. So I can conclude that the John’s phone meets all its promises and is fully worth the 80 euros. It makes a real statement on going back to basics with a phone. But there is one thing I am doubting. And that is the chosen concept of a basic phone. 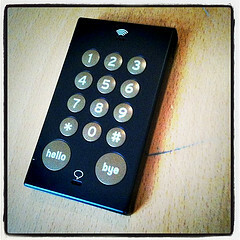 The pay off on the website is: “the world’s most simple phone”. That is probably true. I am wondering however what the concept of a simple phone is. In the definition of John’s Phone simple means: just calling. Nothing more and nothing less. It would be interesting to think what a simple phone can be. And start this thinking by what the functions of a mobile phone means for a user. I think a phone can solve up to the first three functions to stay simple. I (still) know a lot of people that uses their phone for calling and texting, but let’s forget texting and limit it to a device for being reachable and calling. It looks like the John’s Phone delivers for that. But I think it misses some elements that are part of these functions: a basic phonebook and caller recognition. There is no reason to make a digital phone without these functions. Some years ago there was a hype of the Motorola F3 simple phone. It had the same problems: making a simple phone does not mean to limit the functions to the bare minimum. I think a good simple phone try to meet the most basic demands and perform the best on that. Of course: the John’s Phone is more a statement than a serious useful product, but it would be great if there was done a good analysis on the basic needs that create a real simple phone. I think that could be a popular device, especially when it looks and feel like the John’s Phone.